Here we take you through all the basics of contact centre workforce management (WFM) software. Put simply, WFM is all about assigning the right staff to the right job at the right time. Although that might sound simple, it is in fact a complex business challenge, because there are many factors that come into play. While most still rely on spreadsheets when it comes to staff scheduling, some companies use specialist software for resource planning, customer record management and HR. In fact, almost 45% of contact centres do, as highlighted by the following graph. While doing each of these three things, you should monitor and analyse your results, which will allow you to see whether you are meeting your targets and take prompt action if not. A WFM system will help you to optimise and automate all of this, as we investigate below. For workforce planning to be successful, you must be able to predict your short, medium and long-term staffing requirements. When forecasts are inaccurate, the schedules are irrelevant. 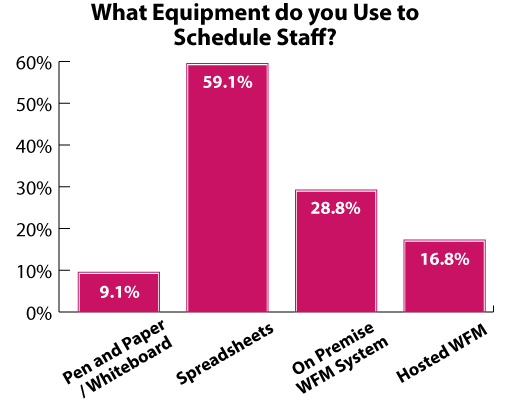 A basic WFM system will help you to forecast how your business activities will develop and how these plans will affect your staffing needs, by using historical data to provide predictions about future needs. Most of these modern systems work across multiple contact centre channels and have been developed so that resource planners don’t have to manually put together forecasts, which can be a long, tedious process. 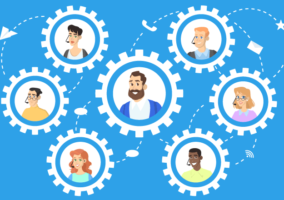 The main objective of staff scheduling is to create schedules that align well with forecast contact volumes, while taking into account employees’ availability and preferences. Basic schedules can be created by using an Erlang Calculator, although WFM software can automate this process to best match supply and demand. This helps to minimise under and overstaffing the contact centre. Basic schedules can be created by using an Erlang Calculator, although WFM software can automate this process to best match supply and demand. However, there is much more to modern WFM systems than this. No longer is WFM just about having the right number of staff in place at the right time, it’s also about having the right skills. In addition, these systems are flexible to any schedule pattern – whether that’s fixed shifts, rotating patterns or annualised hours – the software builds schedules around patterns that you define yourself. Top-of-the-range software can also work across multiple sites, as well as multiple channels – such as inbound/outbound calls, email, live chat and social media. Unfortunately, it is impossible to gain complete visibility into activities that impact future contact volumes, forcing contact centres to do the best they can with available information. Information gaps occur when contact volumes are driven by activities outside of the contact centre’s control or as a result of unexpected events, such as systems problems or lack of communication between departments. While it’s good to have a series of Standard Operating Procedures (SOPs) and to multi-skill advisors to better prepare for these situations, WFM software can guard against this. WFM systems may have a dashboard that will allow you to monitor key metrics, such as service level, forecast accuracy and queue time, which need to be given close attention to improve performance and for effective time management. When one of these three metrics starts to “waver”, the contact centre can make moves to turn the situation around, to minimise the impact of the unexpected increase in contact volumes. Also, of course, schedules must match your staffing needs. Too many staff means extra costs, too few could compromise customer service. Yet the number of things that contact centres (especially 35+ seat contact centres) need to take into account – as highlighted above – is too large to be handled in a simple spreadsheet. To achieve all the benefits listed below, WFM requires a system with considerable power. The benefits of putting an integrated WFM system in place can be seen in many areas of the business, but most are operational and employee-related. By allowing you to automate and standardise routine recurring tasks, a WFM system gives you time to focus on what’s important. Also, the system helps you integrate operations, finance and monitoring to reduce costs related to staff, admin and IT. A WFM solution allows you to provide a working environment and schedule to suit your employees’ needs better, and to match employee skills with business needs. Can a Return on Investment (ROI) Be Expected? Every company has to consider whether a given investment will pay for itself, and over what timescale. However, the introduction of a WFM solution will likely generate immediate a number benefits, including those listed above. How Do I… Manage and Schedule Multi-Skilled Agents? Originally published in March 2010. Recently updated. Great points! Thanks for the article. Respecting employee availability and including employees in the scheduling process are so integral to scheduling, I would add that to the “Why can’t you do this with a spreadsheet?” section.